Today is the 43rd death anniversary of one of the most iconic stars of Hindi cinema. 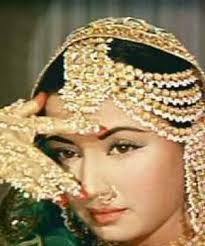 The Tragedy Queen, as she was dubbed, thanks to the number of weepy roles that she played, Meena Kumari is one of the best-known actresses of her generations till date. She starred in approximately ninety films in a career (that started early, when she was but a child) that spanned over three decades and ended when she died of a liver ailment at the age of 39 on 31st March 1972. Meena Kumari was born Mahjabeen Bano on Aug 1, 1932 as the third daughter of Ali Baksh and Iqbal Begum (her mother was born a stage dancer and actress, a Hindu, related to the Tagore family of Bengal). Her father was a small-time musician (who composed for a few films) , actor and a poet. Mahjabeen Bano made her debut as Baby Meena at the age of 7 in a Vijay Bhatt film in 1939. It was in a Vijay Bhatt movie at the age of 20, she was to gain fame as a heroine. The movie was Baiju Bawra, for which she won the Filmfare Best Actress Award. This set the tone of her future career, in which she gained much success playing the silent, suffering woman, be it Parineeta or Dil Apna Preet Parayi or Dil Ek Mandir. But the role she is known best for is that of ‘Chhoti Bahu‘ in the Guru Dutt classic Sahib Bibi aur Ghulam, considered one of the finest performances in Hindi cinema. As a tribute, here are my favourite songs picturised on her. I have tried to restrict the list to solos and the songs are listed in no particular order. 1) Mohe bhool gaye saanwariya (Baiju Bawra, 1952, Lata Mangeshkar, Naushad): This one brings with it many warm childhood memories. One of my mum’s favourite songs, sung beautifully by Lata Mangeshkar, this song is about heartbreak and dejection. Meena Kumari looks pretty and is convincing as the heartbroken, defeated lady in love. 2) Na bole Na Bole Radha na bole re (Azaad, 1955, Lata Mangeshkar, C. Ramchandra): Now, this film was a revelation. One would think that since it stars the ultimate tragedy king and queen in the lead roles, this would be one sob fest. But no, not at all. This is a fun and an entertaining movie and has Meena Kumari at her bubbly best. She looks beautiful and Dilip Kumar is charming and the movie has lovely songs. And from all those lovely songs, this is my favourite. 3) Lau Lagati geet gaati (Bhabhi ki chudiyan, 1961, Lata Mangeshkar, Sudhir Phadke): This movie had the more famous Jyoti Kalash Chhalke, but this is my favourite. I love this bhajan. And moreover, this film, despite its title was a revelation. It is one of the movies, in which Meena Kumari does not cry. She is not a doormat, but strong and self-respecting. She is wonderful as the bhabhi. Worth a watch. 4) Ruk Ja Raat Thehar ja re Chanda (Dil Ek Mandir, 1963, Lata Mangeshkar, Shankar Jaikishen): This is a song from an extremely melodramatic and a horribly weepy movie – a movie that I just did not like when I watched it ages back. And it also had Rajendra Kumar, an actor I am allergic to! But the movie had melodious music. This song is a poignant song sung by Meena Kumari to her husband, a man she was forcibly married to but whom she has learned to love. The situation here is that he is going to be operated upon the next morning and they both know that he may not survive the surgery. Meena Kumari is brilliant as the desperate wife, in love, and hoping against all odds that her beloved survive. 5) Bane Ho Ek Khaak Se (Aarti, 1962, Lata Mangeshkar, Roshan): Meena Kumari bagged all the three nominations for the Filmfare Best Actress Award in 1962. This movie, in which she stars with Pradeep Kumar, was one of the three roles she was nominated for. Aarti had brilliant music by Roshan and the lyrics were by Majrooh Sultanpuri. Kabhi Toh Milegi, brimming with optimism, is perhaps a more popular song even today, but my favourite is the more philosophical Bane ho ek khaak se. 6) Piya Aiso Jiya mein Samaye gaye ro (Sahib Bibi aur Ghulam, 1962, Geeta Dutt, Hemant Kumar): In this Guru Dutt classic, Meena Kumari turns in the performance of a lifetime, pouring her heart and soul in the role of Chhoti Bahu. This song is romantic and passionate, as Chhoti Bahu dresses up for her husband, expectantly and in the belief that he will be with her. A lovely song, sung wonderfully by Geeta Dutt, this song is that of a woman’s desires and expectations. My favourite song from the movie is Koi door se awaaz de, picturised on Meena Kumari’s character, but you hardly get to see her. Hence I picked this other one. 7) Sansaar se bhaage phirte ho (Chitralekha, 1964, Lata Mangeshkar, Roshan): This 1964 movie is based on a novel based in the Mauryan times and reflected on the philosophy of love, sin and renunciation. Roshan’s music is wonderful and this song is just one of the many gems. Man re tu kahe na dheer dhare and Ae ri jaane na doongi are two others. Meena Kumari plays a dancer and Pradeep Kumar is a soldier who is in love with her. Ashok Kumar plays a sanyasi who heads an ashram. At one point in time, Meena Kumari disillusioned by her life as a dancer, decides to renounce the world and take up sanyas. But to her shock, the head Sanyasi (Ashok Kumar) falls for her and is unable to resist the temptation. This song is played when Ashok Kumar denounces Meena Kumari for her wicked, sensual ways and this is her rejoinder to him. Sahir is at his finest, as the song captures the epicurean philosophy of the courtesan as she contrasts her ways with that of the ascetic. The moral in the end is probably that an excess of anything is bad and its the middle path that should be chosen. The courtesan was wrong but so was the ascetic. I was torn between this song and the lovely Bandish in Raga Kamod, Ae ri jaane na doongi. But picked this – for its soul-searching lyrics. 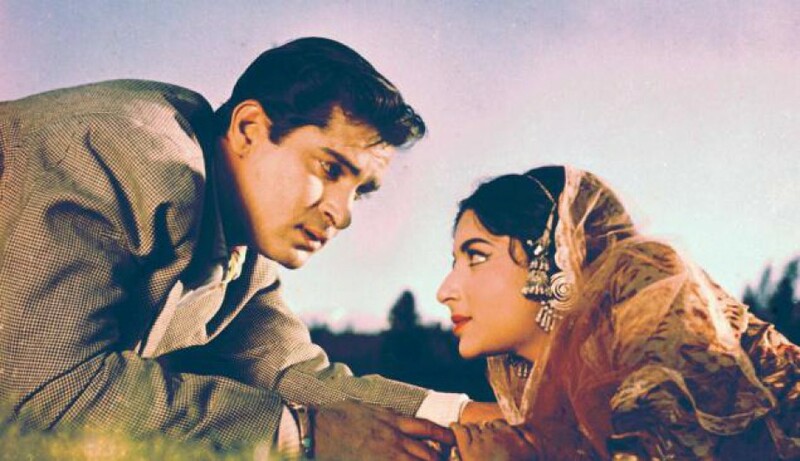 8) Ajeeb dastaan hai yeh (Dil Apna Aur Preet Parayi, 1960, Lata Mangeshkar, Shankar Jaikishen): Probably one of Meena Kumari’s most popular numbers ever, this song can be heard in jingles and ring tones even today. 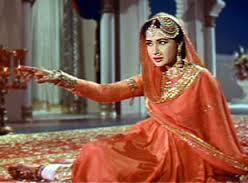 Meena Kumari looks gorgeous as she sings this plaintive number after the man she loves weds another. And yes, this song has the lovely Nadira, as a bonus! 9) Chand Hai Wohi (Parineeta, 1953, Geeta Dutt, Arun Kumar): Next on the list is one of Geeta Dutt’s sweetest songs. This melody is from the 1953 Bimal Roy classic Parineeta. The lyrics penned by Pt. Bharat Vyas are set to music by Arun Kumar Mukherjee. The video is not available so do listen to this song! 10) Hum intezaar karenge (Bahu Begum, 1967, Asha Bhosle & Mohd Rafi, Roshan): And finally, ending it with a duet from Bahu Begum. This duet is sung hauntingly by Asha and Rafi and is picturised on Meena Kumari and Pradeep Kumar. The wonderful lyrics are by Sahir Ludhianvi. Making this list has been a difficult task. I can think of some 5-6 songs more that I would want on the list. Not to mention many duets that should be here as well. But, one has to stop somewhere. 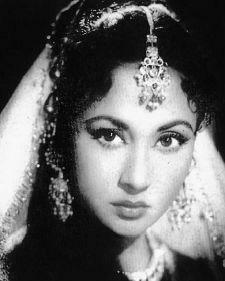 As you will notice, there is not a single song from her swan song, the classic Pakeezah. Directed by her husband Kamal Amrohi, Pakeezah took 14 years to be completed. It had been started in 1958 but had gotten shelved in 1964, after their separation. It is said that in 1969, Sunil Dutt and Nargis convinced Amrohi and Meena Kumari to complete the film. Meena Kumari was seriously ill but she completed the film and the movie released three weeks before her death. It opened to a lukewarm response but became a huge success after her death. The reason why I did not list a single song here was because I could not pick one song from Pakeezah. Hence as a bonus, adding this link that leads to all of Pakeezah’s songs. 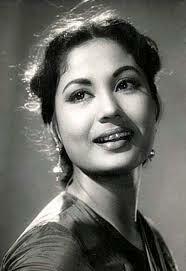 Meena Kumari’s intense performances and her haunting voice filled with grief and pathos are remembered till date. Her popularity remains undiminished and can be gauged by the fact that recently, a biopic on her colourful and sadly tragic personal life has been announced. This entry was posted in Old Hindi songs and tagged Asha Bhosle, Ashok Kumar, Dilip Kumar, Geeta Dutt, Kamal Amrohi, Lata Mangeshkar, Madhubala, Meena Kumari, Mohd. Rafi, Pradeep Kumar, Roshan, Shankar-Jaikishen, Vijay Bhatt. Bookmark the permalink. If I were to do a duets post, then all these duets would be there. I remembered Meri Jaan Meri Jaan, but like the other songs more. Need to listen to Tera khat leke sanam, can’t remember how that goes. Though I am sure, I would have heard it. I love Na jaane kahaan tum thhe too. What a lovely song. I just could not pick one song from Pakeezah; did try though. I would list one and then remember another – so in the end just left it out! Lovely songs here. 🙂 Meena is my favorite as well. I am totally latoo on her. I am off to listen to the lesser known songs, the one from Aarti and Parineeta. It is hard to pick a favorite from Pakeezah songs. Thanks, Ava. Bane ho ek khaak se is a very beautiful song – lovely lyrics, music and singing. I love Chaand Hai Wohi from Parineeta too. Yes, I loved them both. Don’t know why I did not notice this lovely song from Aarti ever. Only heard the other peppier ones. This one is so beautiful.